Madera Flea Market - About | Come shop, sell, explore! Located in the heart of the San Joaquin Valley, the Madera Flea Market is a place where families come to shop, sell and explore! 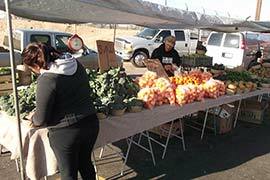 Family owned and operated since 1987, our swap meet has become the premiere outdoor market for Madera County and metropolitan Fresno. 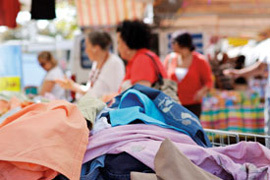 At the Madera Flea Market you can find discounts on a wide selection of new and used items from about 400-500 vendors. We have an estimated 7,000 customers on Wednesdays and 10,000 customers on Sundays. Shoppers are invited to savor the many flavors from our food vendors, enjoy the beautiful California sunshine and take advantage of all our wonderful treasures. The Madera Flea Market is open every Wednesday and Sunday, except during the annual Madera Fair in September. Arrive early to get the best deals and shop from 6 AM – 3 PM. The Flea Market is proud of its diverse and exciting vendors located on approximately 35 acres. Our products include fresh fruits and vegetables, electronics, clothes, shoes, jewelry, toys, beauty products, knick-knacks, furniture, and much more can all be found at this fun and diverse flea market! After shopping through the seemingly endless rows of bargains, sit to refresh and relax at one of the many concessions stands throughout the market. Refresh yourself with freshly squeezed fruit juices; sweet, locally grown fruits, or a hearty meal at one of our many food concessionaires. No matter what, your appetite will be taken care of from a menu of tasty foods. Open Wednesday & Sunday from 6 AM-3 PM (except during the annual Madera Fair in September). Vendors must be on the lot before 9 AM. No vehicles driving on lot between 9 AM and 3 PM for the safety of our customers. Admission is $1.00 on WED and $1.25 on SUN. Children 12 and under are free when accompanied by an adult. Parking is free. Please park at your own risk, there is no parking attendant. No animals allowed on premises (service animals with proper identification allowed). ATM machines available at Walgreens (2020 Cleveland Ave.) and Chevron (1801 Cleveland Ave.).